High performance SUVs – yes, they’re a thing and their numbers seem to be growing. But in recent years, GM hasn’t fielded an entry. 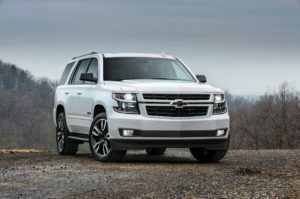 Until now – with this new Tahoe RST, available for the first time with the company’s 6.2-liter V8 and other street truck upgrades. Perhaps you remember the TrailBlazer SS, Silverado SS or SSR – hot rod Chevy trucks of recent vintage. Now it’s the RST editions that are reviving the pedigree. Short for Rally Sport Truck, the big boy Tahoe and Suburban are the first up to go RST. Remember – there’s the RST Edition which only gives you part of the street truck look and then there’s the RST Performance Package that drops in the 6.2, 10 speed Auto, and performance calibrated suspension. These brakes and Borla exhaust are extras. Available on the 2 highest Tahoe trims, the RST Edition adds $2,630 to the price and includes 22” wheels, black bowties – seems like every Chevy has them these days, gloss black grille, black mirror caps and black badging. Set against this summit white paint the RST has certainly got the look. But it’s the next $2,820 that adds the real stuff. That’s where you’ll find the 420 horsepower engine, the Ford-developed 10-speed gearbox, high-capacity air cleaner, a transfer case with 2-wheel, auto, 4-high and 4-low settings, Magnetic Ride Control suspension with a performance calibration and a trailer brake controller. The larger front brakes which really seem more like a necessity with this much power and weight are a dealer installed option and cost a hefty $2,795. The dual side-exit Borla exhaust with black chrome tips is another $1,249 and nets an additional 7-10 horsepower at the wheels. You get the picture – a loaded Tahoe 4WD RST with Performance Package isn’t cheap. How does $80,000 sound? Definitely some sticker shock here. Don’t think of the RST in the same vein as a Trackhawk or the like – it’s just so much bigger and heavier that it’s impossible to extract that much performance. You won’t be taking this to track day or autocross. What it is: is a brawny, body on frame truck with a stiffer suspension. Add in the throaty exhaust and upgraded front brakes and it’s a confident Tahoe for those who crave a little more of everything. I can’t rectify its price per pound of additional fun so it’s a pass for me but I’m sure some will see the allure. The Tahoe feels massive at over 5,600 pounds as you tower over just about everything else on the road. And these seats are created for the fat cat who can afford one so there’s virtually no holding you in place during spirited driving – a sport seat option would be nice. Despite the normally excellent MRC dampers, this Tahoe has lost its smooth, big rig ride quality with the 22” all-season tires playing a factor while adding considerable drag on the steering. Yeah, it bites a little harder on turn in and body sway is muted but not to a degree that would warrant this kind of investment. The most impressive RST component is the powertrain. This high-tech V8 and its 460 pound-feet of torque can go into V4 mode to save fuel and is direct injected with variable valve timing – quite the engineering marvel. And it gets a legit 17mpg in combined driving…far more than you’d expect though it wants premium gas. But this transmission needs a sport mode in order to keep the power on demand because the 10-speed sometimes takes an awful long time to kick down. Plus, the gas pedal is designed for truck-like work so it takes a deep push to extract the power. Once you’re there though this Tahoe can run a sub-6-second 0-to-60mph time which sounds more impressive than it actually feels. I’d like even more rumble from the exhaust, though…it’s pretty tame for Borla. Towing is rated for 8,100 pounds. Inside, features abound from wireless device charging to a blu-ray player to a head-up display to top-notch infotainment. It’s living large 3-row style with every creature comfort inside to make it comfortable and easy to use. This Cocoa/Mahogany combo looks rich in quality, too. A huge center consoled bin, power operated 2nd and 3rd row seats from the tailgate area, all-weather floor liners, living room accommodations with a drop down screen, easy access 3rd row seats, vibrating safety alert seat replete with all of today’s electronic helpers…OnStar, Wi-Fi – this is a great place to spend time and Chevy has aged this cabin very well. The big price tag seems more legit when viewed from the prism of amenties. Keep in mind, because of the Tahoe’s construction, the 3rd row seats are fine as long as you don’t have long legs because the floor is raised so they’ll be in your throat. The panoply of RST bits takes the Tahoe in a credible street truck direction but its performance fails to wow with the force of $80,000.